Since 1999 there has been a consistent view on the possible future land uses for this part of Erf 595, which has been documented in various municipal planning reports. The spatial development framework (SDF) is a fundamental part of longer term planning. It encourages consideration of potential spatial developments, and gives opportunities for open discussion between the community and the municipality. The Greyton Commonage Spatial Framework Plan was compiled during 1999-2000 and contains broad guidelines and conservation/development proposals for the future use of the Commonage. The document shows that a broad public participation process was followed. Promote sustainable economic development, especially tourism. No subdivision or alienation of land. Detailed agricultural investigation before any development permitted. The Commonage Program that is controlled by the Dept of Land Affairs is responsible for assisting municipalities to develop conditions that enable poor residents to access existing Commonage. Clearly TWKM, in proposing to sell off a significant part of our Commonage having no plan to manage it or to consult the community in regard to appropriate and sustainable land uses and activities. There are grants available and training to assist small-scale farmers. The policies and guidelines above were confirmed in the SDF (2012). 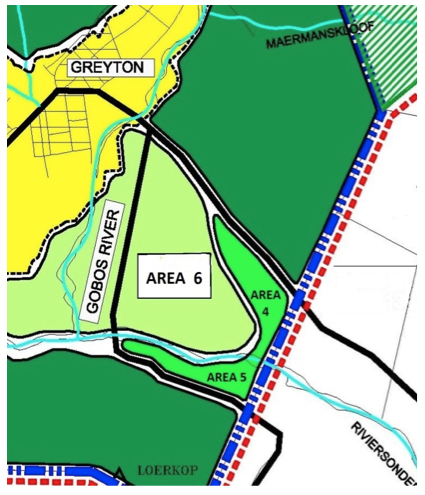 It was also proposed that the areas (dark green on the map) be formally incorporated into the Greyton Nature Reserve in order to protect the ecological role of the Commonage within the context of the mountain catchment area, the river eco-systems and the Nature Reserve. Agriculture was considered a potential land use for the proposed project in 1999-2000, subject to confirmation of adequate soil quality. During the last 15 years, fruit farming has expanded significantly, not least in the Sonderend river valley. The northern adjacent property is part of Zand Vlakte (Farm 136) an intensive dairy farm that has been totally transformed to grassland and crops. We consider there is strong support for a mix of land uses in this area of the Commonage that would bring significant benefits to the communities of Ward 2 whilst also meeting the requirements of government policy and the expectations of Greyton residents. We have seen no comments on the effect any changes will have on that portion of von Solm Street on the same side of the river. Are we to bear the brunt of any changes?? Could we have some comments showing that we do matter ! Many thanks for the helpful summaries, they are in effect providing an ‘articulated public forum’, where all who have access may consider and respond. This report contains many significant policy components and makes the current proposal, subject to review of the business plan and analysis of the TWK ‘permission’ to sell position under some considerable need to explain how these fit together and match best outcome options. I also provide a link – http://farminfo.co.za/ to an online farm resourse to help people see where all of the farm boundaries are around Greyton. If TWKM’s claim to the Greyton people’s commonage can be legally contested – then there is no need to rush into developing this very valuable land that Herbert Vigne left to the People of Greyton in his will. I don’t believe that this land should benefit anyone but the community of Greyton, especially the poor – and as Greyton Council’s feedback in their 26th Feb “Introduction by Developers” GC letter (regarding the alienation of plot 595 for commercial fruit farming) – “Most questions(from Greyton community) concern the principle and legality of the sale of what many Greytonians consider to be our “commonage”. This is something that Greyton people need to secure, so that we as an integrated village, can decide what we feel is best for all concerned.